The classic 1998 science fiction movie Dark City arrives on Blu-Ray which takes the original movie beyond its original theatrical release and adds to this exceptional film. Even though the movie may have not been a theatrical hit, the movie did gain a steady following through its TV and DVD releases. The movie could almost be considered the original Matrix due to its complex storylines that always question the viewer and of course beat the Matrix by a year or so. As to the story, when John Murdoch (Rufus Sewell) wakes with no memory, he is accused of a murder that he may or may not have committed and is being hunted by Inspector Frank Bumstead (William Hurt). Questions come into the fray as he tries to "think" about his life, only to discover certain parts of the puzzle such as him being married to Emma, a beautiful cabaret singer played by Jennifer Connelly. Eventually he meets Doctor Daniel Schreber (Kiefer Sutherland) who promises to fix his problem, only to discover that the city he lives in is a prison. When John questions the reality of his world, strange albino typed men begin to chase him as he eventually uncovers their deadly secret and threatens the very fabric of reality. Where the Director's Cut version does shine is through the extended footage that gives more background on some of the motivations of the characters and actually does make the movie a more thorough and enjoyable experience. Originally when I first saw Dark City, I was not that impressed, however the movie through its intricate plot only grows on you and although I have not seen the movie for over 5 years, Dark City is still one of the most outstanding science fiction movies made. Director Alex Proyas does a remarkable job at creating this story based on a tale by David Goyer through the actors who have been chosen wisely and even the early uses of CGI as the viewer is taken on a roller coaster ride of twisted truths and hideous nightmares. 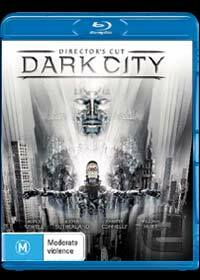 Video and audio wise, the Blu-Ray edition of Dark City is superb that is presented at 16:9 widescreen for 1080p HD viewing and looks amazing on our high definition TV. Match that with amazing audio quality and this is as close as one will get to experiencing the original cinematic version. The director's cut also contains a variety of great special features and even both the Director's Cut and Theatrical features available, however the Director's Cut is far superior to the original. The featurettes will also take you behind the scenes of this gritty, dark and noir-inspired science fiction movie, giving you an almost holistic movie experience.